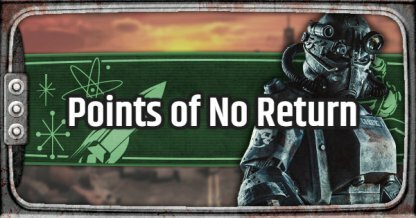 Find out the different points of no return in Fallout 76 in this guide! Included are the locations you can not go back to & locked out quest objectives. As an open world game, Fallout 76 has linear quests can be done at any time and locations that can be revisited multiple times. However, there are also quests and locations that can be locked out! With no manual saving and option to reload, all your actions are permanent in Fallout 76. Story and side quests cannot be redone in this game. 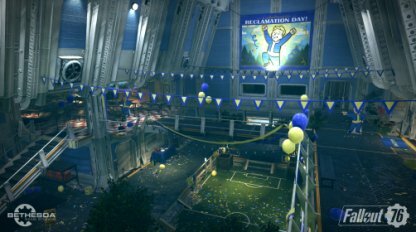 Once you exit Vault 76 in the Reclamation Day Quest, there's no going back so make sure to loot all that you can before going out to the wastelands. Take the samples found in the booths to help you in you first minutes of gameplay. Failing to kill the Yao Guai before the time ends in the Flavor of Mayhem Quest will close off that quest objective with no chance of redoing it again. The quest will progress whether you kill it or not. Currently, Perk Points cannot be respeced so once you choose an attribute, there's no way of changing it. Make sure to weigh out your options first before choosing with attribute to spend your perk on. Fallout 76 developers has announced that a patch will add options to respec Perk Points. 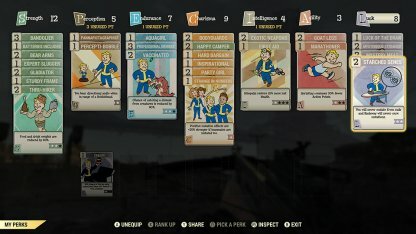 Every time a player levels up after 50, they can choose between a Perk Card of respecing a SPEACIAL Perk Point.